Imbue your room with a comfortable yet supremely sophisticated vibe with this traditionally-styled storage piece. This chest of drawers has the weight and heft of a piece of antique, heirloom furniture, completed with the rich look of expertly-chosen cherry wood veneers. The seven-drawer bedroom chest is completed with handcrafted carved bead mouldings, chamfered posts, and classically-styled brass bail pull hardware. The Coventry Hills Ellington Seven Drawer Chest with Traditional Bail Pull Hardware by Lexington at Malouf Furniture Co. in the Foley, Mobile, Fairhope, Daphne, and Gulf Shores, AL area. Product availability may vary. Contact us for the most current availability on this product. Coventry Hills is a rich, traditional look in a grand scale, tempered with a warm wood finish for an appeal of timelessness and comfort. This collection of Rustic Cherry wood draws special attention to the cathedral patterns in the wood grain, creating a look of craftsmanship and artistry. The autumn brown wood finish brightens the cherry veneers a bit more than the traditional color of cherry and gives the collection a soft, pleasing luster. 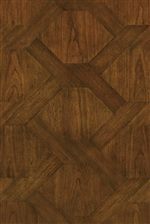 Adding more sumptuous detail to this collection are fancy-face veneers- carefully chosen patterns made with smaller pieces of wood to create an effect akin to a parquet floor. 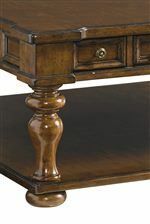 The intricate fancy faces are showstopping on Coventry Hill's traditionally-styled dining and occasional tables. Coventry Hills also offers a wide variety of dining room tables and seating options, with choice of wood chairs or upholstered host chairs. Dining room storage is accompanied by matching storage pieces for the living room or bedroom. Traditional upholstery with a casual feel completes this collection with our signature impeccable taste in design. 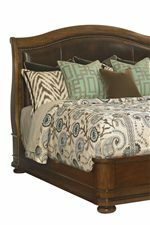 The Coventry Hills collection is a great option if you are looking for Traditional furniture in the Foley, Mobile, Fairhope, Daphne, and Gulf Shores, AL area. Browse other items in the Coventry Hills collection from Malouf Furniture Co. in the Foley, Mobile, Fairhope, Daphne, and Gulf Shores, AL area.